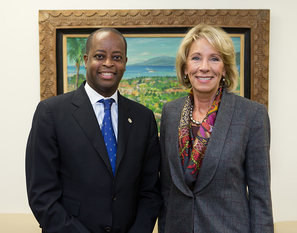 U.S. Secretary of Education Betsy DeVos traveled to Howard University to meet with Howard University President Dr. Wayne A. I. Frederick, M.D., MBA, followed by a meeting with student leaders. Secretary DeVos, right, and Howard University President Dr. Wayne A. I. Frederick. Secretary DeVos meets with Howard University officials and students. She was joined by White House official Omarosa O. Manigault, left. 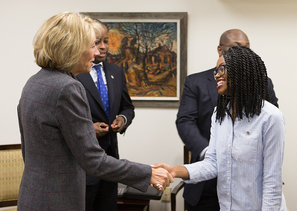 Secretary DeVos greets a Howard University student. High resolution versions of the photos.